Jon Kitna, who last played for Dallas in 2011, is coming out of retirement. Just call him Santa Kitna. Jon Kitna, who came out of retirement this week to rejoin the Dallas Cowboys as an emergency backup QB, was teaching math and coaching football at a high school when opportunity came knocking. And now that he’s back in the league, he hasn’t forgotten where he came from. Kitna’s donating his entire $53,000 game check from Sunday’s game against the Eagles to Lincoln High in his native Tacoma, Wash., the Dallas Morning News reported. And if the Cowboys win and make the playoffs, who knows how big that donation could be. Kitna, 41, hasn’t played since backing up Tony Romo for three games in 2011. But Cowboys coach Jason Garrett signed him after just a phone call, over three other QBs he worked out, because Kitna knows the offense and started 124 games in his NFL career. 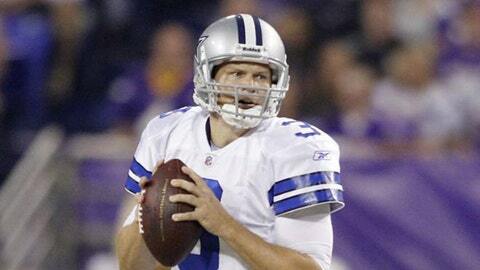 Kitna likely will be backing up Kyle Orton, with Romo nursing a herniated disk in his back.